Ruell Chappell of Play it Forward SWMO in the KSMU studios. Play it Forward began as an organization in St. Louis that collects used instruments and donates them to kids in need. It was Rick Snelson who told Ruell about the group three years ago. They worked together to get a southwest Missouri chapter going. I sat down with Ruell to talk about his experience with Play It Forward and how it helps kids in our area to become musicians. “Long story short, neuroscience has come to the agreement that playing an instrument is the full-body workout for the brain,” said Ruell. Play It Forward works by collecting gently used, playable instruments and donating them to students whose school or parents can’t afford one. They accept all instruments except upright pianos, the pain that they are to haul around. 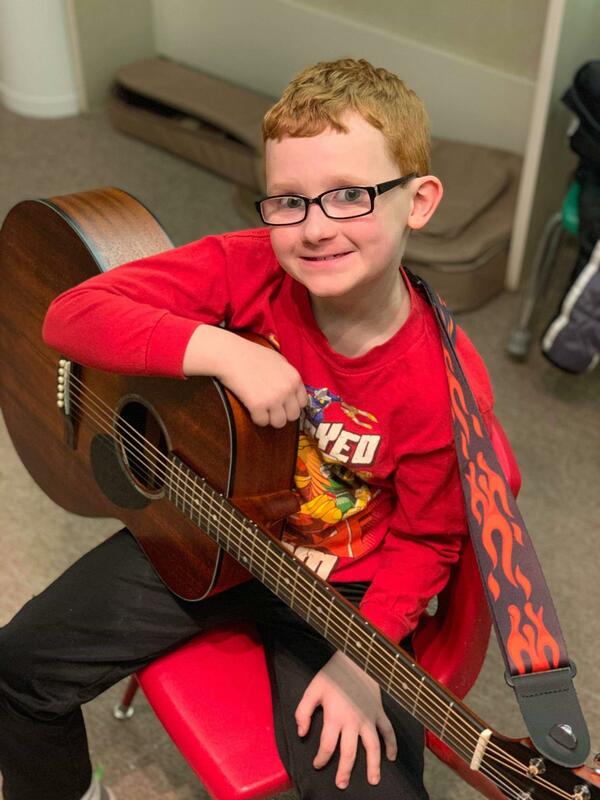 “The last two years, we have donated about, at the end of the year, by the end of the year, somewhere in the vicinity $20,000 worth of instruments to kids,” said Ruell. With all of these donations, Ruell tells me about the coolest story that stands out to him. A boy of about 10 or 11 years old wanted to play the guitar. Play It Forward was able to provide him with that instrument. “It was a nice little guitar, and he just loved the way it looked. It was kind of a chocolate swirl-looking thing. It was all wood. It was a beautiful guitar,” said Ruell. The boy set to learning how to play his new guitar with teacher Kristen Brown. Ruell was delighted with his progress. That was all brought to a halt this last December. The young guitar player who received a new guitar after he lost his in a house fire. Ruell went to Rick Snelson to see what Play It Forward could do to get a new instrument for the young guitarist. Being the end of the year, they were already over budget. But with Rick’s big heart and Ruell’s can-do attitude, they made it happen. “We were able to get him a new guitar, and it was exactly the same guitar,” said Ruell. The boy was thrilled to be given a second chance at something he thought was lost forever. Ruell knows that Play It Forward provides an important service to the region. “You can give a kid a lot of things, but when you give them something they can learn – man. I mean, you can tell. You can tell by looking in their eyes,” said Ruell. I asked Ruell what that feeling is like for him. “Oh man! There’s nothing better! I tell everybody this is the great job in the world,” he said. If you have an instrument that is not in use lying around your house, consider donating it to Play It Forward Southwest Missouri to make a difference in a child’s life. You can find more information at playitforwardswmo.org.